Pulsed Interleaved Excitation (PIE) is a technique of synchronizing several pulsed lasers. 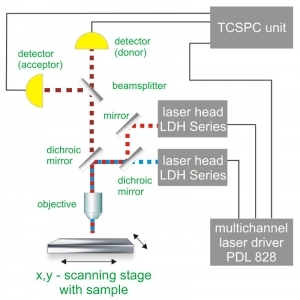 The laser pulses are separated on a nanosecond time scale to allow simultaneous recording of the temporal behaviour of a sample molecule corresponding to each individual laser. For this method usually two lasers are chosen with suitable wavelengths for sequential excitation of both fluorophores. The laser pulses are delayed with respect to each other to yield a pulse sequence with interleaved pulses. To avoid crosstalk, the laser repetition rate is adjusted in that way that the fluorescence of each dye decays completely before excitation of the other fluorophore. PIE is often used in combination with single-species Foerster Resonance Energy Transfer (spFRET) wherein donor and acceptor are excited alternately. In this way, the acceptor dye is excited independently of the FRET process to prove its existence and photoactivity. Molecules lacking an active donor or acceptor are separated from active FRET complexes. This allows to differentiate a FRET molecule, even with a very low FRET efficiency, from a molecule with an absent or non-fluorescing acceptor. 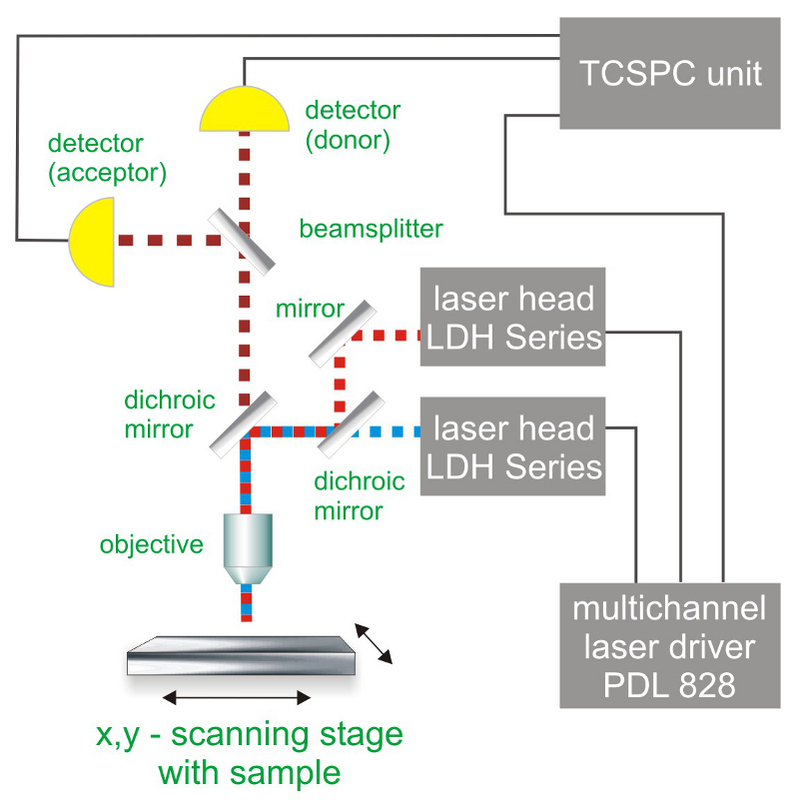 PIE experiments require at least two pulsed lasers and a dedicated multi-channel laser driver. In that way arbitrary burst patterns can be generated, which is extremely useful for e.g. multicolor excitation schemes. Confocal Laser Scanning Microscopes (LSMs) are widely used tools in cell and molecular biology, biochemistry and other related sciences. 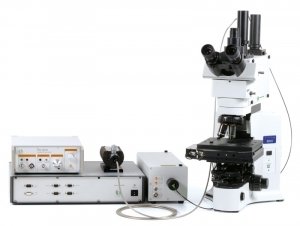 PicoQuant's LSM Upgrade Kits greatly enhance the capabilities of these microscopes by extension to time-resolved techniques, and thereby providing not only Foerster Resonance Energy Transfer (FRET) or Fluorescence Lifetime Imaging (FLIM) but also Fluorescence Correlation Spectroscopy (FCS) and a wealth of other time resolved techniques. The LSM Upgrade Kit combines PicoQuant products to a ready-to-use kit that fits your specific application on a state of the art Laser Scanning Microscope of your choice from Leica, Nikon, Olympus or Zeiss. 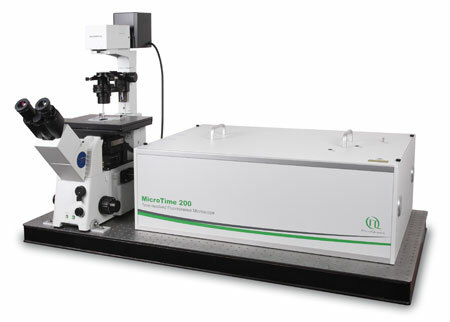 The upright time-resolved microscope MicroTime 100 contains the complete optics and electronics for recording FRET, FLIM, FCS as well as fluorescence decays in small volumes by means of Time-Correlated Single Photon Counting (TCSPC). The system is based on a conventional upright microscope body that permist easy access to a wide range of sample shapes and sizes. PIE is a very useful tool in FRET experiments. For studies resolving molecular distances in the nanometer scale, FRET can be enhanced using PIE to eliminate contributions from incomplete FRET pairs with missing or non fluorescing acceptors. The analysis of single-species FRET (spFRET) measurements is often complicated by the fact that not all molecules under study are necessarily marked with both donor and acceptor molecule, but often lack e.g. the acceptor molecule. Additional complications arise from multiple labeled species, giving not only one but multiple FRET processes. A differentiation between these single species is realized by applying PIE, but is effectively only possible on the single molecule level. 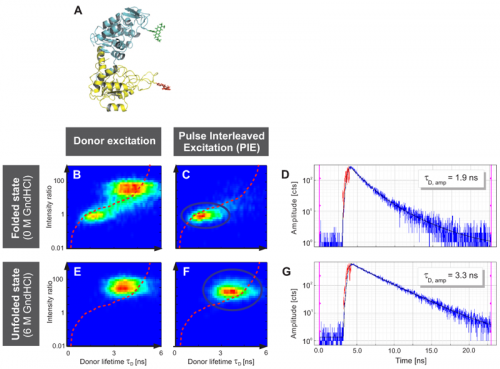 The underlying approach is based on pulsed interleaved excitation of both the acceptor and the donor molecule. With PIE, the three subpopulations donor only, acceptor only and complete FRET molecules can be distinguished. Furthermore, the concentrations of all three species can be derived using time-gated FCS after burst selection. It is therefore in principle possible to deduce all important parameters necessary for the FRET efficiency calculation (e.g. cross-talk of the donor emission into the acceptor channel and direct excitation of the acceptor) from a single measurement containing a mixture of all three subpopulations. This is of great importance under conditions where control measurements can not easily be performed, e.g. in living cells. 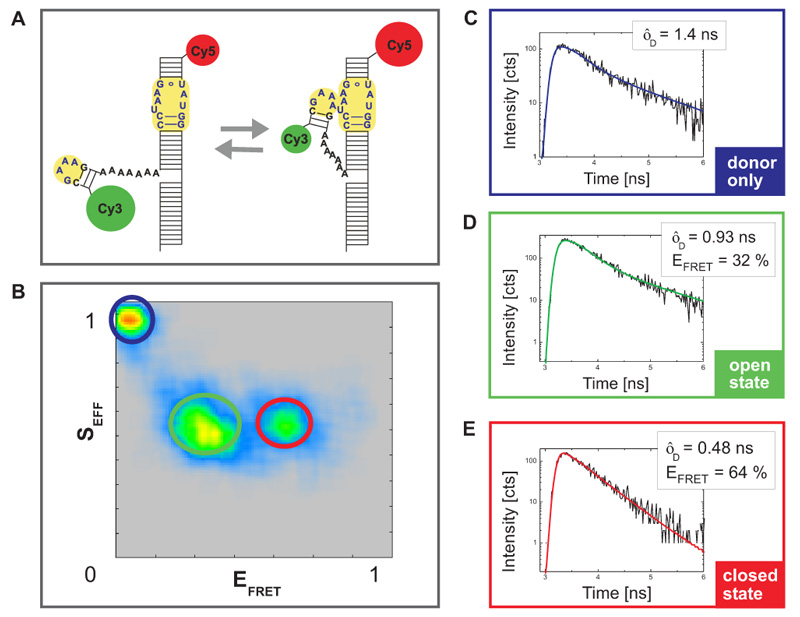 The method can even be extended for excitation with more than two wavelengths for complete analysis of triple FRET or FRET in combination with the detection of further, fluorescently labeled molecules. In addition, PIE allows for an excellent separation of different dyes due to the dye-specific excitation wavelengths which is also applicable for measurements performed in liquids (e.g. FCS). This results in enhanced sensitivity and elimination of crosstalk in FCS and FCCS experiments. Furthermore, PIE is used for simultaneous multi-color excitation with a single detection channel. As a variant of PIE, pulse trains can be generated in phosphorescence lifetime measurements to accelerate the acquisition time. Prothrombin is a plasma protein that circulates at a concentration of 0.1 mg/ml. It is composed of 622 aa, organized in 4 domains and 3 linkers. Crystallization of prothrombin has succeeded only recently and required deletion of the Gla domain or significant portions of the flexible Lnk2. An unexpected molecular picture has emerged from these structures: prothrombin is organized as two rigid ends, the N-terminal Gla domain/kringle-1 pair and the C-terminal kringle-2/protease domain pair, capable of different relative arrangements mediated by Lnk2. Here we apply single molecule Förster resonance energy transfer (smFRET) to investigate the structural architecture and dynamics of prothrombin in solution. 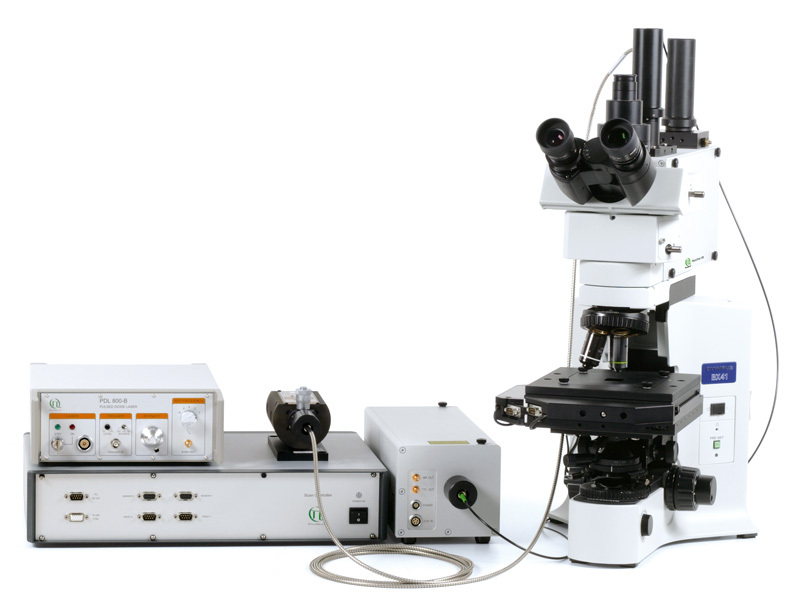 We record the fluorescence of molecules freely diffusing through a femtoliter observation volume defined by a focused laser beam and confocal optics. Our experiments are carried out with pulsed interleaved excitation (PIE), which reports the status of both donor and acceptor fluorophores by sorting molecules on the basis of relative donor:acceptor stoichiometry (S) and apparent FRET efficiency (E). The conformation of full-length prothrombin in solution was investigated with FRET couples positioned in the N-terminal Gla domain/kringle-1 pair (34/101), the C-terminal kringle-2/protease domain pair (210/478), or across the flexible Lnk2 (101/478 and 120/478). 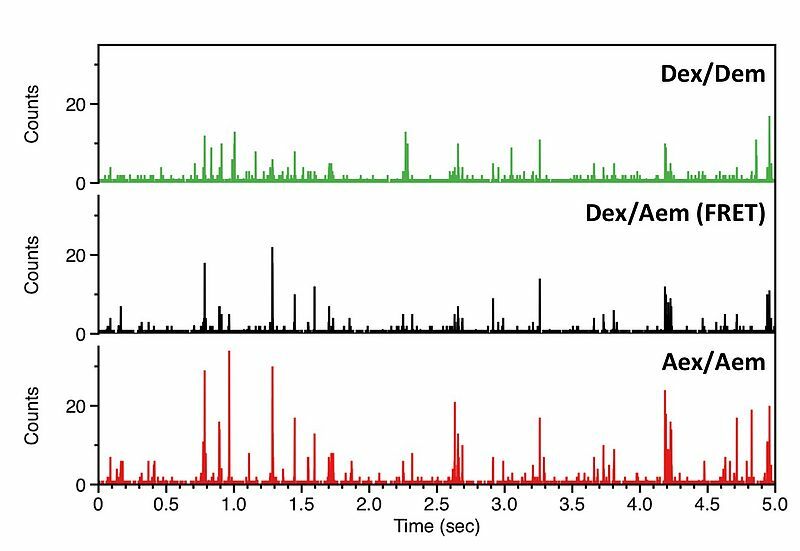 Only the FRET couples positioned across Lnk2 report two distinct populations of interprobe distances. The flexibility of Lnk2 produces relative arrangements of the rigid ends of the zymogen in solution not captured by our recent X-ray structural studies. Using information from existing crystal structures of prothrombin and the interprobe distances measured by smFRET we built a model of the closed conformation of prothrombin in solution that shows the intramolecular collapse of kringle-1 onto the protease domain mediated by the Y93-W547. Prothrombin exists in equilibrium between two alternative conformations, open and closed, that differ 50 Å in length. The closed conformation predominates (70%) and features an unanticipated intramolecular collapse of Y93 in kringle-1 onto W547 in the protease domain that obliterates access to the active site. The analyzed construct contains an important RNA folding motif consisting of a tetraloop receptor labeld with CY5 as acceptor fluorophore and a flexible tetraloop fused to the donor CY3 (Fig. A). The RNA folding is Mg2+ driven and can be monitored by FRET as this construct could adopt two different conformations: an open state without any interaction between tetraloop and receptor and a closed state wherein due to the interaction between the two regions the donor and acceptor dye come into very close vicinity. This leads to FRET and a quenching of the donor fluorescence intensity and lifetime. S is decreasing towards smaller numbers if the acceptor is present and can directly be excited via PIE. Thus, the population with a higher value of S and almost zero FRET efficiency corresponds to donor only labeled molecules. The other two populations have a similar photon stoichiometry but different FRET efficiencies. For each sub-population the donor fluorescence lifetime was fitted by a 2-exponential decay model (Fig. C-E). The longer lifetime component was used to determine the FRET efficiency. The sub-population with the lower E corresponded to the open configuration whereas the molecules exhibiting a closed configuration and interaction between tetraloop and tetraloop receptor showed high FRET efficiency. Single-molecule FRET (smFRET) studies of phosphoglycerate kinase from yeast (yPGK) were performed at different concentrations of guanidine hydrochloride (GndHCl) to investigate protein folding. Fig. A displays the three-dimensional structure of yPGK and the fluorophores Alexa 488 and Alexa 647 attached to position 135 in the N-terminal (cyan) and position 209 in the C-terminal (yellow) domain, respectively. This FRET pair displays a Foerster radius R0 of 48.9 Å.
Interdomain distances of the native state and evolving unfolded states at increasing GndHCl concentrations were analyzed. 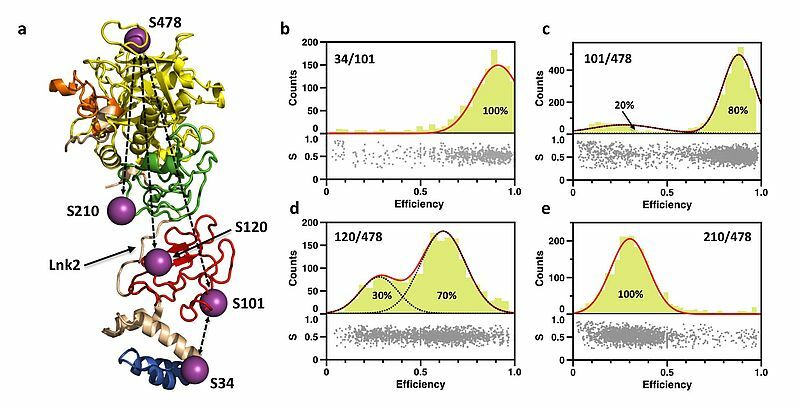 The conformational characterization of native and unfolded states was performed by measuring FRET efficiencies for individual protein molecules at different GndHCl concentrations. The results of the Multiparameter Fluorescence Detection (MFD) with the depiction of the FRET indicator FD/FA versus the donor lifetime τD are shown (Fig. B, C, E and F). At 0 M GndHCl mainly the native population with high FRET was visible (Fig. B and C). The fitted donor fluorescence lifetime decreased to 1.9 ns (Fig. D). Without PIE, the donor only population was additionally observed (Fig. B). An unfolded state population with no or low FRET and significantly expanded structure compared to the native state was detected at 6 MGndHCl concentration (Fig. E and F). Without PIE it is not possible to differentiate between this unfolded state and the donor only population (Fig. E). After exclusion of the donor only subpopulation via PIE (Fig. F), the unfolded protein configuration could be analyzed and a donor fluorescence lifetime of 3.3 ns was fitted (Fig. G). 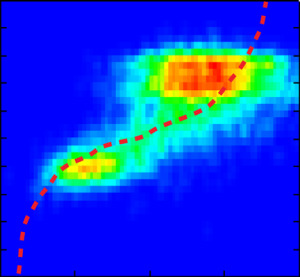 The red lines indicate the theoretical prediction between the FRET indicator FD/FA and the donor lifetime τD in the presence of the acceptor2 taking into account distinct fluorescence quantum yields and detection efficiencies. Thus, the combination of PIE with MFD enabled for quantitative smFRET experiments. Data courtesy of by J. Fitter, Research Centre Jülich, Germany.